Delegates from across 17 African countries are attending FIDIC-GAMA 2017 - a gathering of global players and partners in the infrastructure and consulting engineering sector. Under the theme "African Partnerships for Sustainable Growth", the conference seeks to facilitate the creation of innovative, sustainable solutions and business opportunities. Following the FIDIC-GAMA 2017 Young Professionals Congress held the previous day, Monday, 8 May saw the annual Conference on Infrastructure get under way with Chris Campbell, CEO of CESA, playing programme director. Providing opening remarks was Abe Thela, FIDIC-GAMA 2017 LOC chair; Kofi Asare-Yeboah, GAMA chairman; Moncef Ziani, FIDIC vice president; CESA president Lynne Pretorius; and executive mayor of the City of Cape Town Councillor Patricia de Lille. 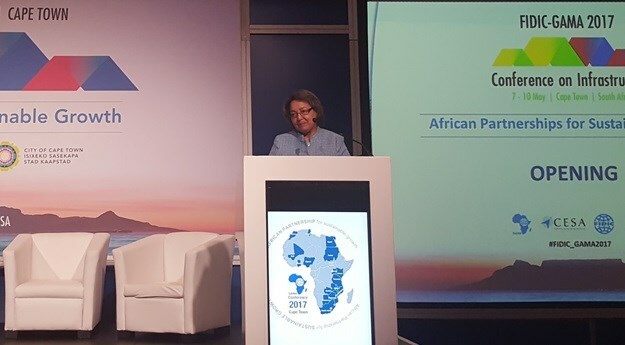 Councillor Patricia de Lille at FIDIC-GAMA 2017. The focus during the opening session was on building and strengthening partnerships at all levels, particularly inter- and intra-African partnerships that will see greater collaboration across the continent. "Amongst the African countries that are members of GAMA, none of them, with the possible exception of South Africa, has the right number and strength of indigenous consulting firms to undertake the multiplicity of infrastructure development projects being executed on the continent," said Kofi Asare-Yeboah during his keynote address on African Partnerships for Sustainable Growth. "To their advantage, consulting firms must form intra and inter-regional partnerships to efficiently and effectively use human capital spread over the continent to meet these challenges. Such collaboration would overcome difficulties and complications associated with project identification, funding, and implementation." The FIDIC-GAMA Conference provides the opportunity for cross-border collaboration, bringing together consulting engineers from across Africa, providing a forum and networking opportunity for stakeholders working within the built environment. FIDIC recently expanded its African membership base to include Mali and Côte d'Ivoire, the former set to host next year's conference. "Partnerships between FIDIC and its member associations, and the regional group GAMA, will ensure quality and uniformity in the practice of consulting engineering and will create a conducive business environment for working within Africa," said Lynne Pretorius. She believes that African infrastructure development is critical to social development and economic growth on the continent, pointing to relevant partnerships with similar values as the key to furthering respective strategic objectives. 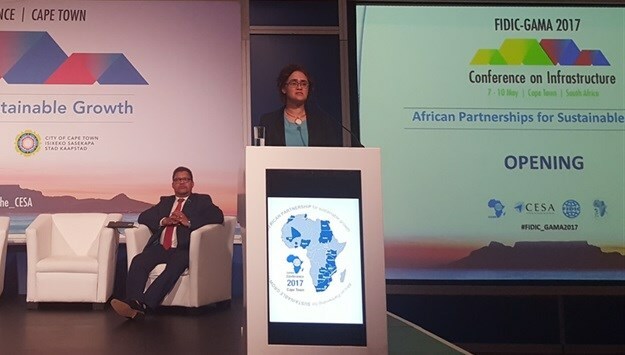 Lynne Pretorius, CESA president, at FIDIC-GAMA 2017. Patricia de Lille concluded the morning keynote session highlighting the impacts of urbanisation and climate change on cities and how engineering solutions were needed in developing and designing resilient infrastructure. De Lille also pointed to cities as key drivers for national economic growth, saying, "If you can grow the economy in our cities, you can grow the economy of your country." Key areas for infrastructural development in the City of Cape Town involve the provision of low cost housing, alleviating traffic congestion in the city, and addressing the drought currently gripping the area. As part of the 100 Resilient Cities network, the city looks to collaboration and partnerships with other cities in addressing its challenges. "That is how we will save our continent," said De Lille, "Work with the cities, let the cities take the lead and not national government - they just tend to talk, they never walk the talk," she concluded.